Use the M10031B 1413 microsecond/cm Conductivity Calibration Solution with your Milwaukee conductivity tester. Box of 25 packets of 20mL each. Milwaukee MW302 Conductivity Meter 0.0 - 10.0mS/cm with Automatic Temperature Compensation & 1 Point Manual Calibration. Free Shipping! 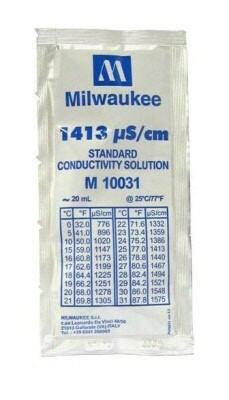 Milwaukee C66 Conductivity meter. Great waterproof water tester. Ideal for Aquariums, Hydroponic grown and Labs.